Howdy all. My cheap tensioner has always performed alright for me; however, upon recently switching to a larger cog (20T), I was unable to run the tensioner in "push-up" mode (clearance issues). Alas, I am now experiencing some chain skippage under even moderate torque. Having adjusted and checked/re-checked my chainline, it would seem that insufficient chain wrap is the likely culprit (chain/cog/ring are new). 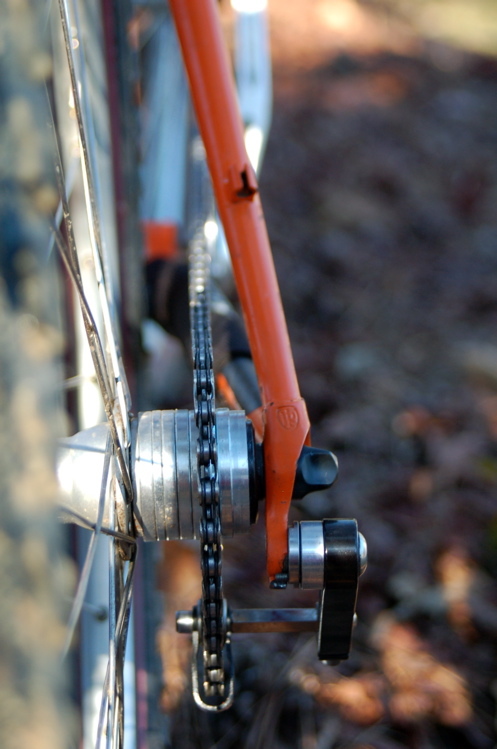 For my current setup (pictured), chain is at the minimum length without using a half-link. Based on my experience and the great info on these boards, I intend to try the following measures (in order of ease/expense), but could sure use some insight as to other approaches I may be missing, etc. 2. Try a different tensioner. Here's where I could use some suggestions, since I've only used this tensioner. Are others (e.g. Rennen, DMR, etc.) sufficiently long to clear the 20T cog? Anyone with experience using tensioners and relatively large cogs? 3. Bite the bullet and invest in an ENO hub -- I realize this is probably the most desirable solution, but those things are pricey! You could go back to your origional rear cog and run a smaller chainring. That would allow you to run the easier gear ratio, and probably use your tensioner in the same manner that previously worked well. I'd try a half link first. They're cheap, so there's not really any risk involved. 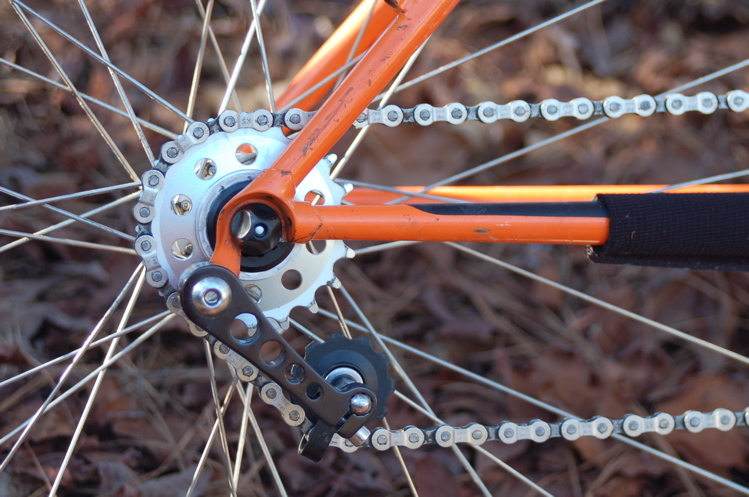 Failing that, if possible, try jumpin_joe2u's idea, and run a smaller chainring. I don't know about other tensioners. You could go back to your origional rear cog and run a smaller chainring. I'd try a half link first. They're cheap, so there's not really any risk involved. These are two great and inexpensive remedies for your problem. But look long and hard at the ENO. That will be the permanent solution. FYI - I have a geared frame and didn't want to mess with a tensioner. I went straight to the Eno, and I couldn't be happier. Over a year of riding and I can run any cog my wimpy legs desire! The ENO also works great.